Invisalign has been proven effective in both clinical research and in practice nationwide. One advantage of Invisalign that makes it so popular is that the invisible plastic makes it an excellent choice for adults who wish to keep a professional appearance while straightening their teeth. 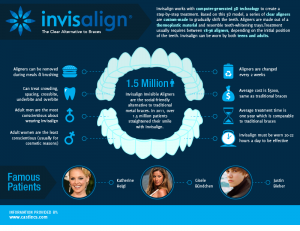 While they are virtually invisible, Invisalign aligners may also be removed when necessary for important events such as presentations and interviews. Invisalign uses a series of custom-made, nearly undetectable aligners to straighten your teeth. Invisalign aligners are made of smooth, clear plastic, and they are exceptionally comfortable. Additionally, Invisalign aligners are removable, allowing you to brush, floss, eat, and drink as normal. You will switch aligners approximately every two weeks to continue adjusting the alignment of your teeth until you have achieved your ideal, straight smile. Invisalign typically corrects your smile more quickly than traditional braces, with an average treatment plan ranging from less than six months to a year. If you wish to enhance your smile and look good doing it, Invisalign is an excellent solution for you. For more information on Invisalign in Boca Raton, FL, we welcome you to call or visit us today. We are happy to schedule your Invisalign consultation so you can discover whether Invisalign is right for you. Let us give you a new reason to smile!